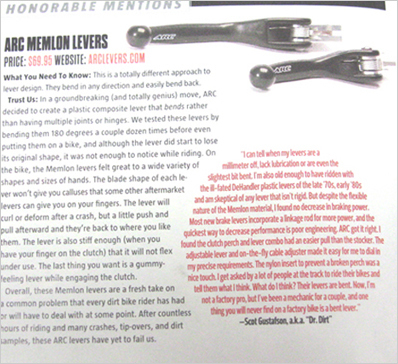 The January '14 issue of DIRT RIDER has the yearly POY awards. Each year it is interesting to see what gear made it through the off-road wringer and onto the list. 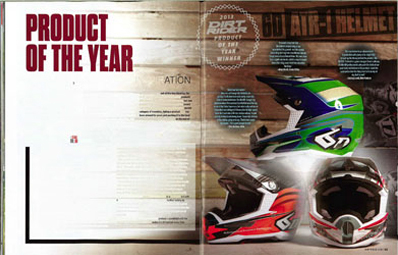 The 6D ATR-1 helmet is truly worthy of POY status. Safety is number one when participating in a potentially dangerous sport. These guys are true innovators and many careers will be extended due to their brilliance. All of us at ARC are very happy about being mentioned in the prestigous POY article. We ride, test, break and make over until we feel that the product is right. Then we give to the public for real world punishment. It is soooo cool when the professional off-road testers at DIRT RIDER Magazine give us a thumbs up. Those guys beat everything hard because that is how they ride and it lets us common folk know what works. 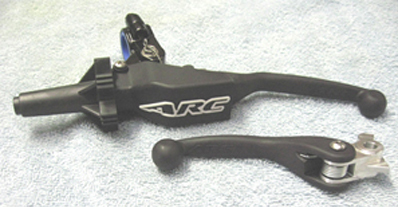 The next time you are in the market for levers, give the ARC Memlon Composite levers a try. You will never be stuck on the trail with a busted lever again! What is MEMLON and why is it on a factory bike??? MEMLON is the trademarked name for the material used in our composite levers. By the lever design it is strong enough to do the job yet resiliant enough to take severe abuse without damage. Check out the lever video that shows how you can bend the lever and bend it back without any signs that the lever was ever damaged. It took over $100,000 in developement and 28 different formulas to find the right material composition. 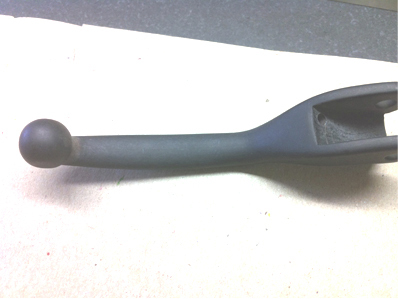 Now through our hard work you can have a truly unbreakable lever on your bike. You will never have a lever problem again. Remember, IF YOU BEND IT, BEND IT BACK, and keep riding. 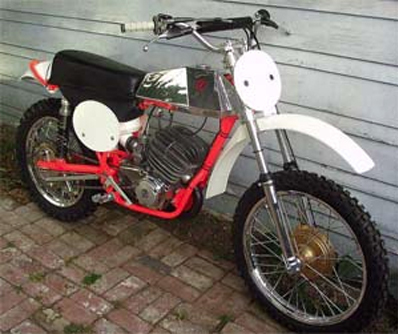 It has been 40 years since there has been a "plastic" lever on a factory motocross bike. 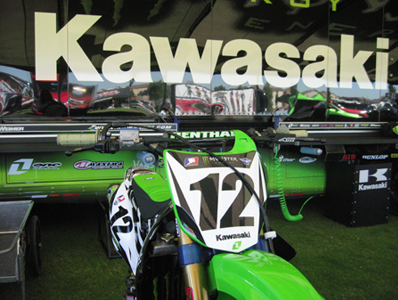 Brad Lackey at factory Kawasaki was the last person to run a non-metal lever at the factory level back in '72. They stopped using them because they didn't work. Ivan Tedesco was the first top rider to see and use the benefits of our new composite brake levers. He went down a couple of times in the '11 SX season with no failure. When those guys go down it is rarely an easy get-off. The next few photos will show the progress through the years that leads up to our new composite levers. 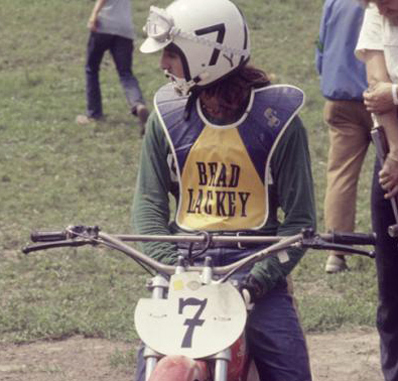 Motocross has been around for over 50 years and the gear has always been on the cutting edge for the time. Racing breeds technology in an attempt to keep ahead of the competition. This is an early White that is one of Tom Whites' finest collectables, no relation. This was one of the finer rides in the day equipped with SMOOTH footpegs and pedals. 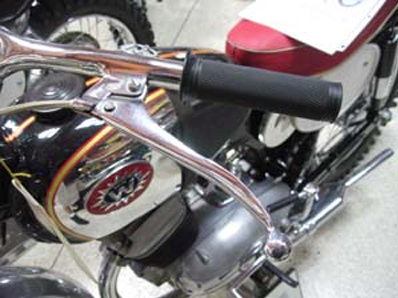 The STEEL levers had perches that were WELDED to the handlebars. It is hard to believe that this bike was cutting edge. You have to consider the manufacturing techniques and materials available at the time.Check out the METAL fenders. The hand craftmanship and love that went into the making of the early bikes is true art. I personally do not wish to race a tractor on a motocross track though. This White 2-stroke was way lighter than the 4-strokes of the day but 250lbs is still a heavy ride. Note the welded steel perches and steel levers that were the standard. A quick adjust was not thought of since nothing about these bikes was quick. Here are a pair of Greeves, a 250 and 380. This was another brand of competitive 2-strokes. The fenders are worthy of a battle ship with the giant brackets and bolts to retain the aluminum fenders. 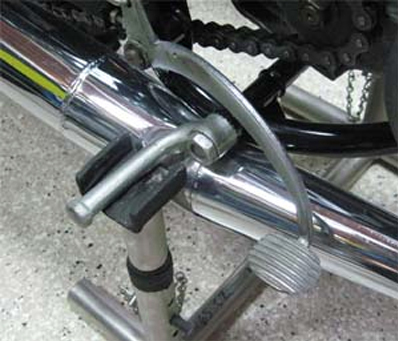 These bikes also used steel levers with the innovation of using a clamp to attach the perch to the bars. That may seem small now but on those bikes the ability to move the levers where you wanted them was huge. When you look at the peg and brake pedal you wonder how anyone could stay on this bike. Smooth steel works really good for restaurant countertops, not the best choice for busting out some laps on the national track at Glen Helen. You can see how it was easy in the early days to make big improvements on the bikes. Not all of the old bikes were made by artists. 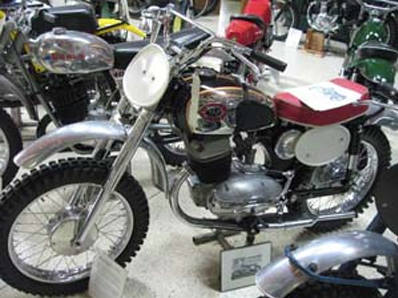 Check out this DKW with a CHROME STEEL fender that has enough bracketry to withstand a force 5 tornado. I really like the door hinge that is right behind the seat making a double steel bracket support within 3". When something is heavy you need heavy stuff to retain it. 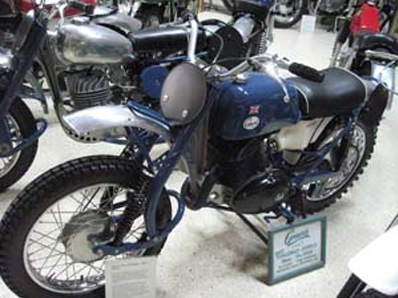 The DKW 125 weighed in at close to 230lbs dry and had something like 17 horsepower. Today that is the equivalent of riding a 450cc with 65cc power and the suspension of a $129 mountain bike. In the late '60's most of the brands went to aluminum for weight savings. This CZ was one of the first while still retaining the welded mount. There was no adjustability for placement on the bar. You rode what was there with no options. Also note that there is no cable adjustment at the lever. If you needed an adjustment you had to go to the pits and open the tool box. Another fine and scary example of the pegs and pedals in the past. At least these pegs are adjustable for height which is a feature not used today. The chrome steel exhaust looks real flashy and ads to the stylish appearance but weighs about 12lbs and there are 2 of them. That is why we have titanium exhausts today. Finally we are getting close to more current technology. For the day this bike has it go'n on. It has a center port cylinder, magnesium hubs, removable clutch cover, aluminum clamped on levers with adjusters, electronic ignition, and PLASTIC fenders. 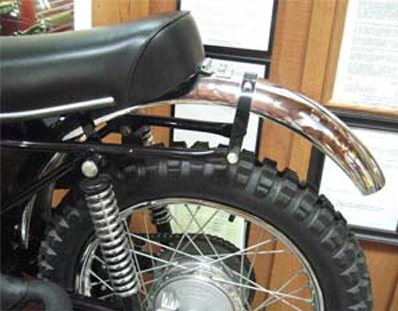 Preston Petty changed the world of off-road riding with his revolutionary polypropolene fenders. They were available in all colors, cheap, and extremely durable. 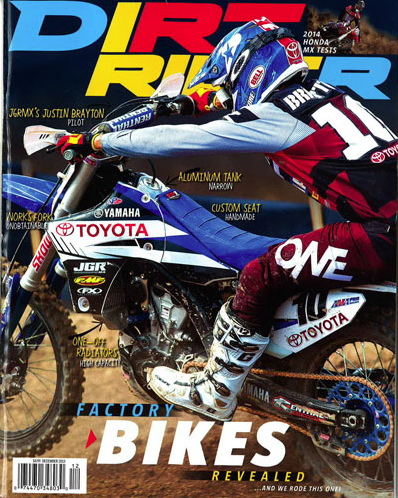 In 1999 he was inducted into the AMA Hall of Fame for his contribution to the sport. Technolgy stays in the same place until someone gets motivated about a problem. Preston solved the bending fender problem. We no longer make the axis perch that rotated on the bar. It worked flawlessly but was a hassle to install and almost priced out of the market. Our composite products achieve the same results with far less cost and anybody can install in a few minutes. 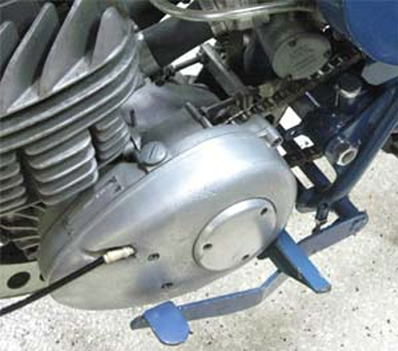 The composite blades cure the bending lever problem. It does not get any better than this! 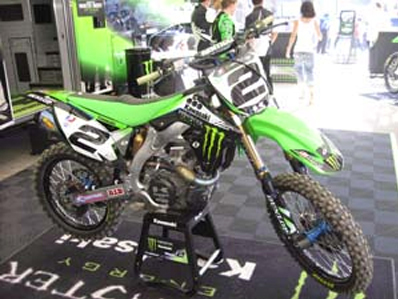 Here is Ryan Villopotos' 2011 SX winning ride. It has a fuel injected, liquid cooled 4-stroke engine, (that can be programmed by a laptop computer), with an aluminum frame and disc brakes. The only parts that are interchangeable with older bikes are the tires and tubes. The steel parts on the bike consist of the crank, gearbox, inner fork tubes, and a few assorted bolts. Most of the metals used are aluminum, titanium, and magnesium with all of the external body parts being a plastic. 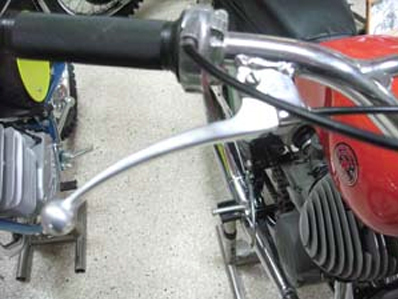 Note the ARC brake lever and clutch perch. 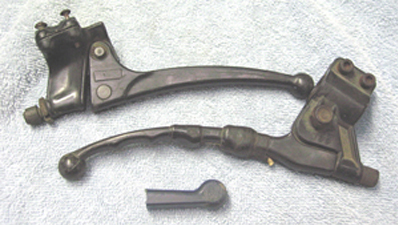 Here are three attempts at making plastic levers in the past. The idea was good but the materials available at the time were not up to the task. The top lever was by Uni-Filter circa 1969. The middle assembly was made by OGK in Japan and the lower tip part was done by Sunline. All of these were produced at about the same time, late 60's through the early 70's. The levers were very flexy and had poor function. It almost did not matter since the brakes of the era were horrible and nobody used the clutch after the start. Today carbon fiber is available at cost effective pricing that allows us to produce a product that is better. Our current gear is cutting edge technology for today. The new composite levers look factory and have a better feel than an aluminum blade. 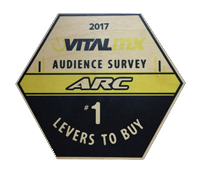 The shape of the lever where your fingers touch is the refinement from all the custom shapes we have done for top riders over the years. They are lighter by about 45% and can take a lot more abuse than conventional aluminum levers. One advantage we have over the earlier tries at non-metal levers is the shape. Since we have a folding/adjustable lever, it is bigger at the 2nd pivot. The lever tapers when viewed from top or back making the lever very strong where you pull with your fingers. There is minimal flex in the lever and it is never felt when riding. If you rode a bike without looking at the levers you could not tell the difference between aluminum or composite. Take a metal lever and bang it on something, it will ring like a tuning fork. The composite levers have no resonance. 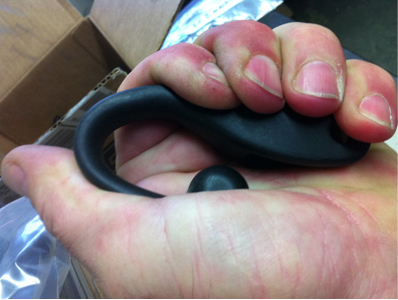 This does not reduce arm pump or make the control any easier to operate, it does allow for a better feel on the control. We are a small company and have to be creative when doing product testing. Here is one of our less costly pieces of testing equipment. You can see it is well seasoned from performing abuse endurance testing. We also ride and crash like everyone else. This is how we static test before driving out to the track. Bending is a major problem when your lever hits the ground. This standard aluminum lever was struck once with the test club seen above. There is about 20mm of bend from being straight. The composite lever can bend to about 40 degrees in any direction 20 times before signs of degradation appear. What this amounts to is that you can crash a BUNCH of times and when you get up your levers are still there ready to go. 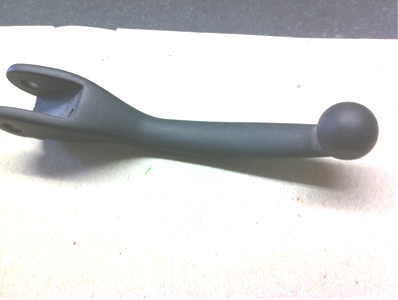 Here is a copy of our latest composite clutch lever. Look at the blade portion where your fingers contact the lever. It is smooth and shiny with no suface defects. You can bend an aluminum lever like this too. When an aluminum lever is straightened it will get you through the weekend but will have wrinkles and be much weaker from the abuse. IT CAN'T BE TRUE! 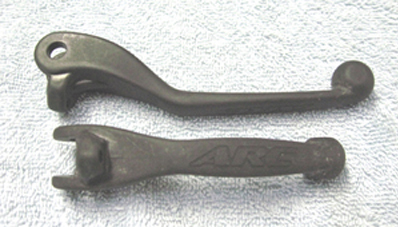 Yes, you can wad these levers really hard for more than 50 wrenchings like this and they still have no wrinkles or signs of diminished strength. This particular lever has been bent over 25 times to show that after many bending/straightening cycles they are still good to go. These are truly unbreakable levers. As said above, it is the shape of the lever that allows this to happen. The lever is really strong where the tapers meet at the finger portion of the lever. The tip can flex in a crash but where you need it to be strong it is.